Have you ever had one of those Job-kind-of weeks? It starts off with your dog “biting” the wrong guy. Proceeds with financial woes, a nasty virus, a really sad/distraught teenager, and a loved one unleashing a harsh, hurtful series of judgements. You get what I mean…a truly crappy week. But in the midst of the turmoil and negative emotions, I miraculously find so many graces. A phone conversation with a loving friend. The support of women of faith who have walked this walk. A beautiful young girl who is growing into the most amazing young woman with a heart so huge I am surprised that her clothes still fit! And above all the awareness that I need so much. I need love, support, strength, peace…all that and more I borrow from a God who does not keep tabs much less tack on fees and interest. There is such relief in taking the lead from Job and surrendering. Well, finally surrendering after he had exhausted all his own resources. Ego tempts me too and challenges me as it tries to get a foothold and stand in its self-righteousness. But where does that get me? So after day 5 of crap I just give up…in a good way. Today I rejoice in not knowing, not having answers, not being perfect, not being in control. I am no longer exhausted by trying to keep it all together. I am free and it makes me cry. 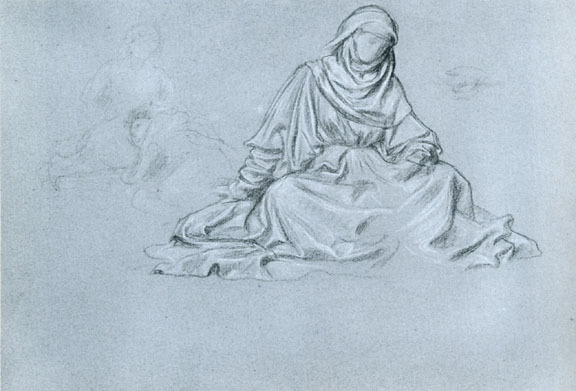 Study of a young woman seated on the ground; for the illustration ‘Under the Plane Tree’ for George Eliot’s Romola by Frederic, Lord Leighton, PRA RWS 1830-1896. Tell me about the dog? My dog chased my neighbors dog and bit my neighbor on the rear. Luckily we were all forgiven after a very contrite apology. Mercy is truly a beautiful thing.